« Holiday Running Streak Begins! Week 1: Thanksgiving through Sunday. Who could resist the delicious fall flavor of pumpkin combined with the rich decadence of peanut butter, all whipped up into a warm, soft cookie? Not me! I love pumpkin, especially in desserts, but for some reason I tend to forget about it after the holidays. 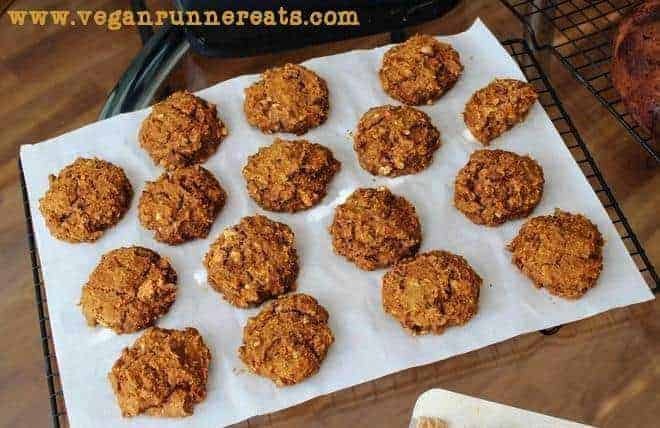 Now that I have the recipe for these yummy Peanut Butter Pumpkin Cookies, I’ll have a reason to enjoy the delicious pumpkin flavor any time of the year. Gotta love that canned pumpkin puree! Here’s how the recipe for these cookies was created. Some time ago, I stumbled upon this recipe for Exotic Spice Cookies from Figgy and Sprout blog. 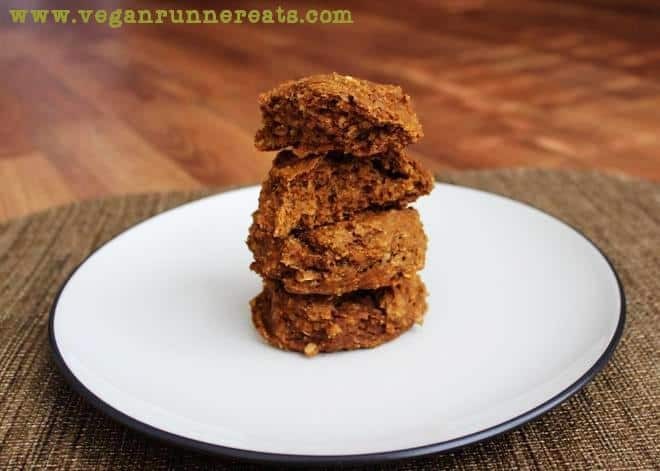 I made them a couple times with some substitutions, mainly skipping the added oil and replacing it with unsweetened applesauce, and using brown sugar instead of coconut sugar. They came out very tasty, at least for my Indian spice-loving palate. Last week, when I was putting together our menu for vegan Thanksgiving dishes, I realized that there wasn’t going to be anything with pumpkin on our table. Feeling adventurous, I decided to take the recipe for the Exotic Spice Cookies and reinvent it with pumpkin instead of oil or applesauce, switch cardamom for a pumpkin pie spice combo, and omit oil again. I used a generous helping of my homemade chunky peanut butter, and it made a big difference: the little peanut chunks tasted crunchy and delicious! As you bite into these Peanut Butter Pumpkin Cookies, you’ll notice how soft they are inside, with almost a cake-like consistency. The flavor is rich, but not too sweet, so they go very well without any mix-ins like chocolate chips or dried fruit. These cookies turned out to be a big success at our friends’ house where we had our Thanksgiving party. Our friends aren’t vegan, so these were the first vegan cookies they’ve ever tried. Our friends’ feedback and the speed with which the cookies disappeared all concluded: these are delicious! These delicious cookies are soft inside, almost like a cake, thanks to the generous amounts of pumpkin puree in the recipe. Pumpkin is a great antioxidant, so you're doing your body good by eating these! Preheat the oven to 350° F. Line a cookie sheet with parchment paper. In a large bowl, combine all of the wet ingredients and spices, mix well. In a medium bowl, combine all of the wet ingredients, whisk to dissolve any clumps. Add wet ingredients to dry, mix with a wooden spoon until just combined. Spoon onto the parchment-lined baking sheet, about one heaping Tbsp per cookie (or more for larger cookies). Bake for 18-23 min, or until the cookies are firm on the outside but still soft in the middle. Cool the cookies on the baking sheet for 5 min first, then put them on the cooling rack. These are especially tasty while still warm! Another delicious, oil-free pumpkin recipe that I shared some time ago: this Pumpkin-Walnut Bread. This recipe is featured at the Virtual Vegan Linky Potluck #14 over here. 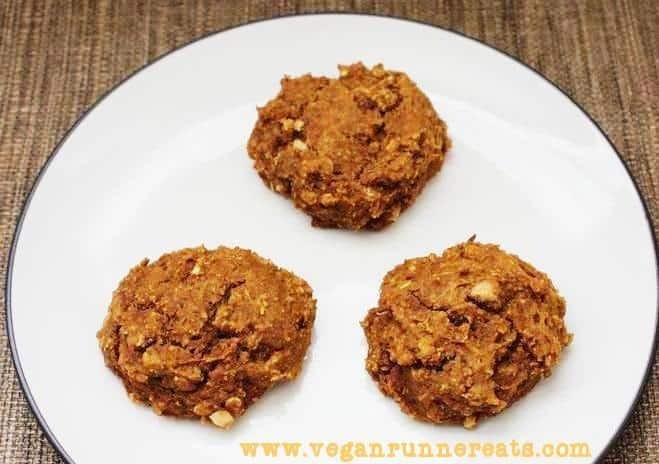 Have you tried other vegan cookie recipes with pumpkin? How did they come out? Please share your thoughts below! Making Peanut Butter at Home from Scratch: Easy, Delicious, and Superhealthy! Stuffed Italian Rice Balls: How I Veganized My Husband’s Family Recipe for Thanksgiving. Tagged baking, cinnamon, cookies, peanut butter, pumpkin, Thanksgiving, vegan dessert. Bookmark the permalink. I love both, but never thought to combine them! Looks and sounds unique and delicious! Thank you Laura! If you make this, let me know how it came out! Do you think I could sub dates for the sugar? Yes! A friend of mine made these cookies with finely chopped dates instead of sugar and raved about them! Perfect! My kind of cookie! I love these, Annie! Thanks for stopping by!